You specify licensing options in Studio. For more information, see Set Course Content Licensing in Studio. When you have determined what licenses you want your course content to have, you set course content licensing in Studio. For more information about licensing options, see Course Licensing. When you create a new course, the license is set to All Rights Reserved. You can change the license for your course in the Schedule & Details page in Studio. The license options that you select apply to all course content, including videos, unless you explicitly specify different licensing options for your videos. Learners see the license at the bottom of all pages in the course. Scroll to the bottom of the page to view the Course Content License section. Select the license option for your course. 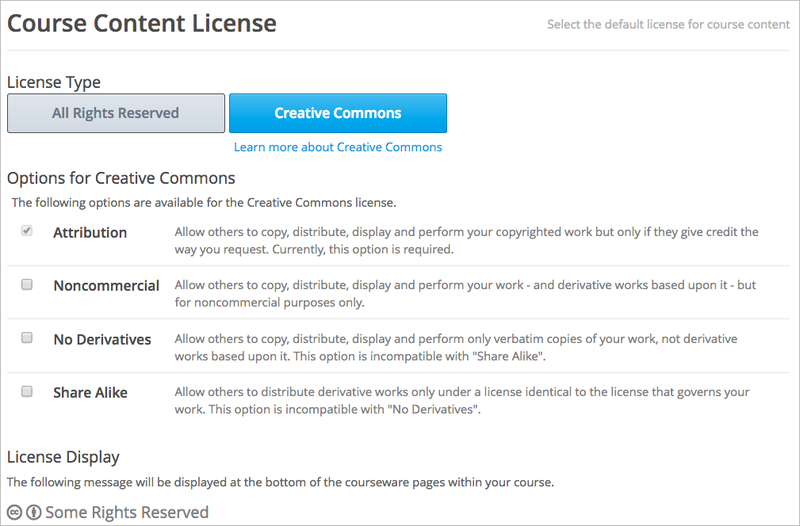 To grant learners to right to share and use course content, select Creative Commons. The Creative Commons options are displayed. Select the Creative Commons license options to apply. To reserve all course content rights, select All Rights Reserved. If you intend for a specific video to have a different license than the course as a whole, you must set the license in the video advanced options.